Sewage is the waste generated from residential, institutional, commercial and industrial establishments. STP plant treats the sewage to make it fit for safe disposal, agricultural use or domestic use in toilets etc. Sewage usually contains a high quantity of organic and inorganic wastes. It is essential to treat sewage before it enters into any water body. If sewage, is allowed to enter the water sources without treatment, it will contaminate them; which is why it is essential to treat sewage properly before letting it into rivers or any other sources of water. In Primary treatment, wastewater is fed to a screen to remove all large objects that are suspended in the water. After this, the water gets into a Grit chamber where the grit is removed. Grit includes sand, gravel, eggshells, bone chips, seeds, and other materials. Grit removal is necessary to reduce heavy deposits in aeration tanks, digester, channels, and conduits. The next step consists of primary settling tanks. These tanks are usually large in size and the solids settle down due to gravity and are removed as sludge from the bottom. Meanwhile, the oil floats on the surface and is skimmed off. 50-60% of the suspended solids get removed and a 30-40% reduction of the five-day biological oxygen demand can be expected. 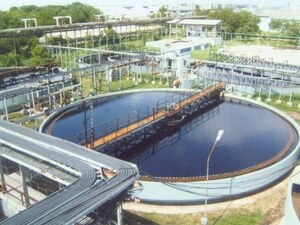 Secondary treatment is the second stage of wastewater treatment. In primary treatment, suspended solids, colloidal particles, oil, and grease are removed. Then second biological treatment is done on the wastewater to remove the organic matter present. This treatment is performed by indigenous and aquatic micro-organisms like bacteria and protozoa which consume biodegradable soluble contaminants like sugar, fat, detergent, and food waste. These processes are sensitive to temperature and with an increase in temperature rate of biological reactions increases. Secondary treatment is divided into two different treatment processes: 1. Aerobic Treatment – Aerobic wastewater treatment is a biological treatment that uses oxygen to break down organic matter and remove other pollutants like nitrogen and phosphorus. Generally, in the sewage treatment, aerobic treatment is performed. 2. Anaerobic Treatment – Anaerobic treatment is a process where wastewater or material is broken down by micro-organisms without the aid of dissolved oxygen. However, anaerobic bacteria can and will use oxygen that is found in the oxides introduced into the system or they can obtain it from organic material within the wastewater. Tertiary treatment is the third stage of the wastewater treatment and is also known as an advanced treatment. Tertiary treatment removes the load of nitrogen and phosphorus present in the water. It includes processes like filtration, ion exchange, activated carbon adsorption, electrodialysis, nitrification, and denitrification. Treatment options in tertiary treatment depend upon the characteristics of effluent after secondary treatment and what kind of water is needed at the end of the treatment. For example, if we need potable water then filtration and disinfectionare implemented to process wastewater.